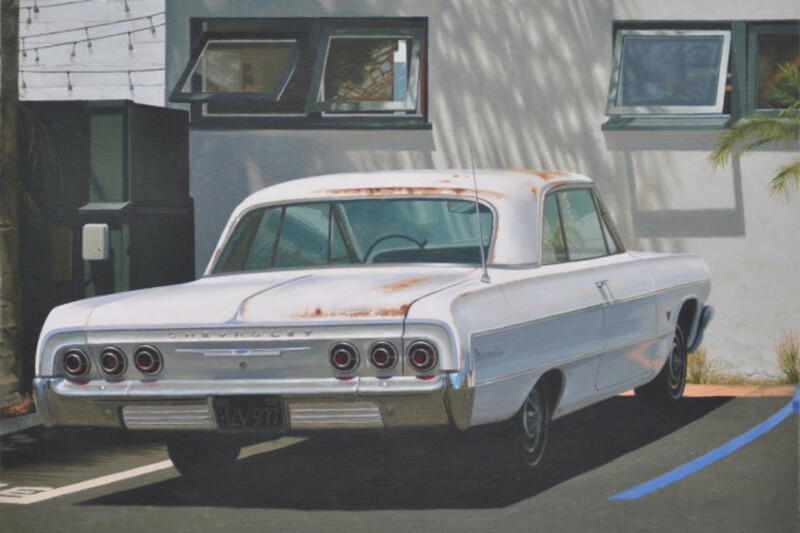 The paintings of Welsh hyperrealist Mike Briscoe have been said to be similar in mood to the work of renowned American realist Edward Hopper. At one level Briscoe's paintings can be enchanting and uplifting, but at another there is an eerie undercurrent, a sense that something is about to happen. We have a chat with Briscoe about his work and question whether creating similarities to Hopper was ever his intention. My artistic process starts with the making of my own stretchers. Stretching and priming the linen gives me control of the size and finish of the surface to be painted. I continue my process by beginning some form of sketching – I usually use a sketch book or on a piece of paper and the detail of my initial sketching often varies. I also gather reference material, such as photographs. Then, once I have all I need, I start drawing an outline onto the linen prior to painting. I use oil paints almost exclusively. I start by thinning the paint with turps for the first process and then build up in layers until I reach the desired finish. With subsequent layers I add a medium, my preference being stand oil. Has your worked EVOLVED since your early days? My work has definitely evolved over the years more so in style and process than in terms of subject. I used to paint in a more abstract manner and also my handling of the paint has changed; in the past I have made more use of impasto and glazing techniques, where the brush marks were far more visible. This technique has made my work far more realist, which is probably the most significant change over the years. I think that camera technology is very useful to many artists and I am sure further advancements will be welcomed by most artists. For me, the speed that a digital camera provides, to retrieve an image and use it as a reference has been the biggest change and benefit in my work. On occasions I still use film in a camera, as I feel it still has a relevant use. In the past your works have revolved around your children and the coast in North Wales, as your children get older do you see your subject matter changing? I have used my children and family as a subject in many of my paintings; I think at the time it portrayed my everyday life, documented days out and the places we visited, often around the North coast of Wales. I have gradually stopped painting my children or people as much in my work. That being said, I often return to subjects as if there is some unfinished business, so I may well include figures again sometime in the future. It has been said that your works hold an unsettling feeling that something is about to happen, similar to that of an Edward Hopper painting. How do you create this sense of anticipation? 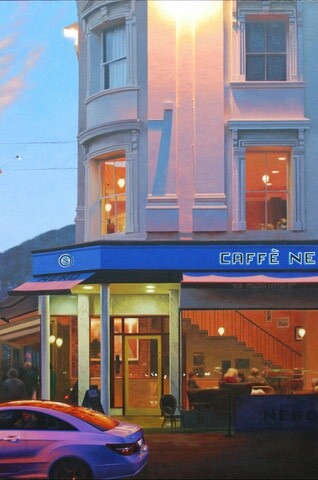 My work has often been compared to that of Edward Hopper, I think the similarities are more apparent in my older works. This could be partly due to the subject, but I think has more to do with the quality of light and colour in the work. It has also been mentioned that some of both mine and Edward Hopper's work can provoke some unsettling feelings and a sense of expectation. Personally, I am not too sure that there is and certainly I do not intend to create that, but some anticipation and intrigue is something that I do try to convey. Your work is very autobiographical. Do you ever paint old photographs of your children or is each painting of the present? I keep lots of photos from my observations of days out and everyday occurrences, sometimes I will look at some older photos and suddenly see a reason to use them, that I hadn’t noticed before. This does not mean that the work becomes a diary of the past, it is very much of the ‘now’. How does your work differentiate from reality and How do you use hyperrealism to portray a deeper meaning? 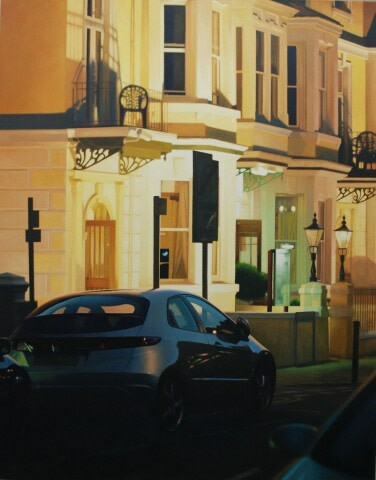 I work in a realist or photorealist style which has best suited what I am trying to convey in my work: my reality. What is interesting about this, is that my reality may not be the reality of someone else. The reality of an individual is dependent on their thoughts, emotions and their understanding of world. I do think that certain feelings and emotions that are experienced from looking at a painting might be similar to the next person, but I welcome and urge the individual to make up their own mind about what they see in my work. I feel my work represents being in the present or the now, even if older recollections surface. Spending a long time painting a subject, the usual becomes unusual and the painting appears to have intrigue and perhaps a bit of mystery to it.